Known as the town at the east-most end of Indonesia. Merauke is the first town in Indonesia Archipelago that catches the first rays of the rising tropical sun. Officially, Merauke as the capital city of Papua province, Indonesia. Merauke as one of the goals in Papua must be visited and enjoyed the beauty of nature. Found on February 12, 1902 by a Dutch citizen who tried to live among the indigenous population of Marind Anim and Sohores. The name Merauke itself is said to originate from an anecdote among Dutch settlers and indigenous. At that time, the settlers asked them for the name of the area. Misunderstanding the question, the locals pointed to the Maro River –the main river that passes the town – and said “Maro Ke” meaning “that is the River Maro”. Over time, “Maro Ke” evolved into Merauke and became established as the name of both the town and the regency. Covering a total area of 45, 071 square meters, the Merauke Regency is also known as one of the largest regencies in eastern Indonesia. It borders directly the neighboring country of Papua New Guinea in the east, Boven Digul and Mappi Regencies in the North, the Asmat Regency in the West, and the open Arafura Sea to its south. The regency consists of 20 districts, with the district town of Merauke being the most populated. Merauke is also known as the staging point for hikers before venturing into the pristinely enchanting Wasur National Park, which is roughly only about 60 km away. For travelers, Merauke offers the most facilities such as banks, internet cafes, airline agents, restaurants, markets, and accommodation. A walk around the town is easy and will reveal some incredible insight into the past. Old graveyards and lots of classic churches highlight the town, while cruising down the Maro River one can observe the daily life of Papuan fishermen. A trip to the local market will be an eye opener, as you encounter various uncommon items. Garuda Indonesia, Lion Air, and Sriwijaya Air serve daily flights to Merauke’s Mopah Airport from Jayapura, Makassar, and Jakarta. Every two weeks Pelni’s (Indonesia Sea Transportation Company) Tatamailau ship sails from Merauke to Agats and Sorong. The Kelimutu ship sails to Agats then sails through southern and Central Maluku, every four weeks. Within and around the town of Merauke, there are a number of interesting sites worth visiting. For a start, the Sabang-Merauke Monument can confirm that you have indeed reached the east-most townIndonesia. As the name suggests, the monument is one of a pair of monuments, where the first stands in Sabang, Aceh Province, marking the west-most point of the Republic of Indonesia. There is also the Pepera Monument which is the icon symbolizing the reunification of the Papua region into the Republic of Indonesia through a UN supervised referendum in 1969 known as Penentuan Pendapat Rakyat (Pepera) or the “Act of Free Choice”. 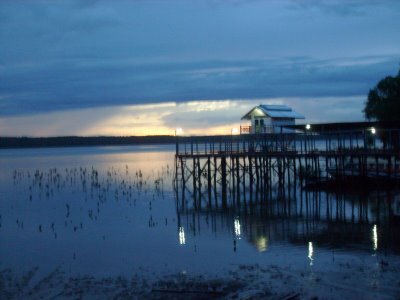 Aside from the Wasur National Park, the natural beauty of Merauke can also be found at the Lampu Satu Beach. The beach is located only 4 km away from the center of Merauke and features a picturesque lighthouse which sheds beautiful light streaks from sunset. 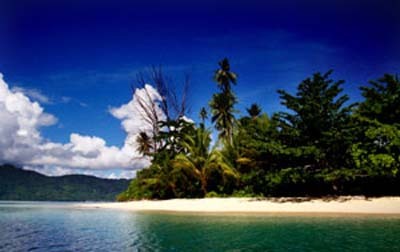 This is most probably what has given the beach its name since Lampu Satu in Bahasa Indonesia means “Single Light”. There is also the Natsai Beach which offers some beautiful panorama.